A bridge is a structure built to span physical obstacles such as a body of water, valley, or road, for the purpose of providing passage over the obstacle and to ease the traffic. Here we specified only about the longest bridge in china - Danyang–Kunshan Grand Bridge since china holds most of the top longest bridges in the world . 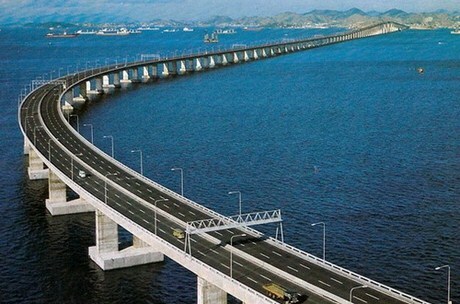 Now, let's take a look at these top ten longest bridges in the world. 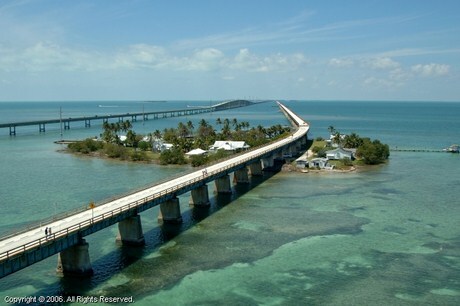 The Seven Mile Bridge, in the Florida Keys, runs over a channel between the Gulf of Mexico and the Florida Strait, connecting Key Vaca (the location of the city of Marathon, Florida) in the Middle Keys to Little Duck Key in the Lower Keys. Among the longest bridges in existence when it was built, it is one of the many bridges on US 1 in the Keys, where the road is called the Overseas Highway. 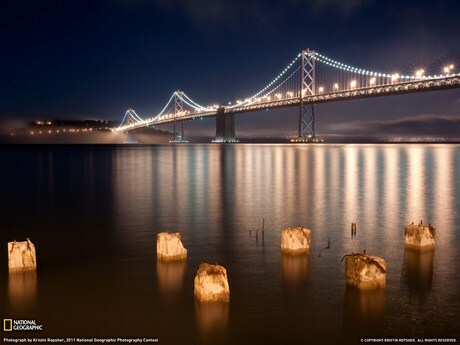 The San Mateo-Hayward Bridge is a bridge crossing Californias San Francisco Bay in the United States, linking the San Francisco Peninsula with the East Bay. More specifically, the bridges western end is in Foster City, the most recent urban addition to the eastern edge of San Mateo. The eastern end of the bridge is in Hayward. The bridge is owned by the state of California, and is maintained by Caltrans, the state highway agency. 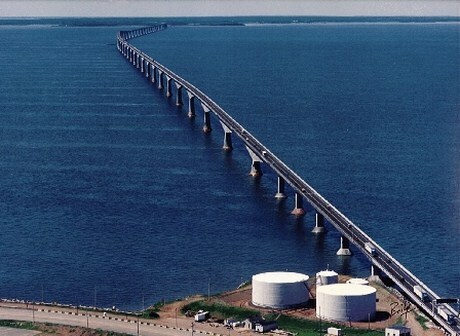 The Confederation Bridge is a bridge spanning the Abegweit Passage of Northumberland Strait, linking Prince Edward Island with mainland New Brunswick, Canada. It was commonly referred to as the Fixed Link by residents of Prince Edward Island prior to its official naming. Construction took place from the fall of 1993 to the spring of 1997, costing $1.3 billion. 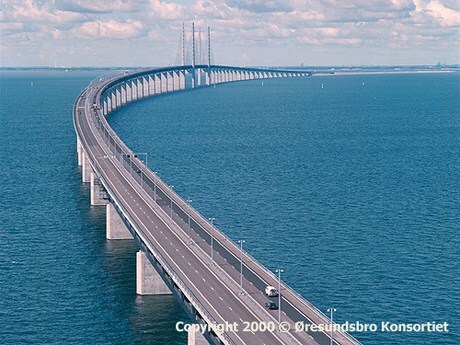 The 12.9-kilometre (8 mi) long bridge opened on 31 May 1997. The Rio-Niteroi Bridge is a reinforced concrete structure that connects the cities of Rio de Janeiro and Niteroi in Brazil. Construction began symbolically on August 23, 1968, in the presence of Queen Elizabeth II of the United Kingdom and Prince Philip, Duke of Edinburgh, in their first and thus far only visit to Brazil. Actual work begun in January, 1969, and it opened on March 4, 1974. 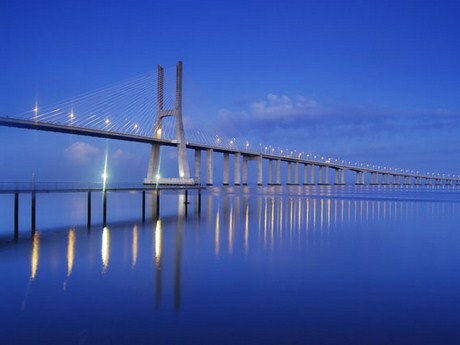 Its official name is President Costa e Silva Bridge, in honor of the Brazilian president who ordered its construction. Rio-Niteroi started as a descriptive nickname that soon became better known than the official name. Today, hardly anyone refers to it by its official name. 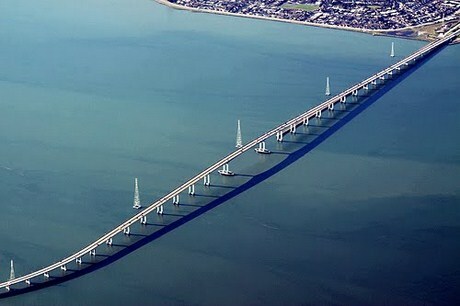 The Penang Bridge is a dual-carriageway toll bridge that connects Gelugor on the island of Penang and Seberang Prai on the mainland of Malaysia on the Malay Peninsula. The bridge is also linked to the North-South Expressway in Prai and Jelutong Expressway in Penang. It was officially opened to traffic on September 14, 1985. The total length of the bridge is 13.5 km (8.4 miles), making it among the longest bridges in the world, the longest bridge in the country as well as a national landmark. The Vasco da Gama Bridge is a cable-stayed bridge flanked by viaducts and roads that spans the Tagus River near Lisbon, capital of Portugal. It is the longest bridge in Europe (including viaducts), with a total length of 17.2 km (10.7 mi), including 0.829 km (0.5 mi) for the main bridge, 11.5 km (7.1 mi) in viaducts, and 4.8 km (3.0 mi) in dedicated access roads. Its purpose is to alleviate the congestion on Lisbons other bridge (25 de Abril Bridge), and to join previously unconnected motorways radiating from Lisbon. The Chesapeake Bay Bridge (commonly known as the Bay Bridge) is a major dual-span bridge in the U.S. state of Maryland; spanning the Chesapeake Bay, it connects the states Eastern and Western Shore regions. At 4.3 miles (7 km) in length, the original span was the worlds longest continuous over-water steel structure when it opened in 1952. The bridge is officially named the William Preston Lane, Jr. Memorial Bridge after William Preston Lane, Jr. who, as governor of Maryland, implemented its construction. 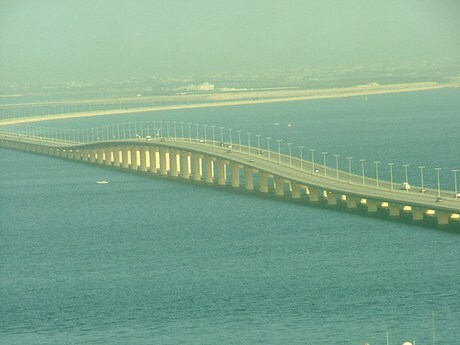 The King Fahd Causeway is multiple dike - bridge combination connecting Khobar, Saudi Arabia, and the island nation of Bahrain. A construction agreement signed on July 8, 1981 led to construction beginning the next year. The cornerstone was laid on November 11, 1982 by King Fahd of Saudi Arabia and Sheikh Isa bin Salman al-Khalifa of Bahrain; construction continued until 1986, when the combination of several bridges and dams were completed. The causeway officially opened for use on November 25, 1986. The Lake Pontchartrain Causeway, or the Causeway, consists of two parallel bridges that are one of the longest bridges in the world by total length. These parallel bridges cross Lake Pontchartrain in southern Louisiana. The longer of the two bridges is 23.87 miles (38.42 km) long. The bridges are supported by over 9,000 concrete pilings. The two bridges feature bascule spans over the navigation channel 8 miles (13 km) south of the north shore. The southern terminus of the Causeway is in Metairie, Louisiana, a suburb of New Orleans. The northern terminus is at Mandeville, Louisiana. 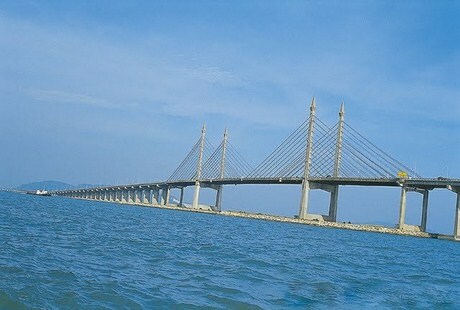 The Danyang–Kunshan Grand Bridge is the world's longest bridge. It is a 164.8 kilometres (102.4 mi) long viaduct on the Beijing–Shanghai High-Speed Railway. The bridge is located between Shanghai and Nanjing in East China’s Jiangsu province. 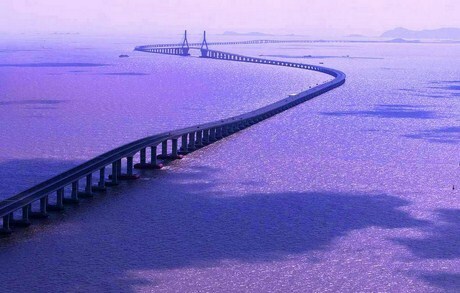 It includes a 9-kilometre long (5.6 mi) section over water that crosses Yangcheng Lake in Suzhou. It is located in the Yangtze River Delta where the geography is characterized by lowland rice paddies, rivers and lakes. The bridge runs roughly parallel and ten or so miles to the south of the Yangtze River. It was completed in 2010 and opened in 2011. Employing 10,000 people, construction took four years and cost about $8.5 billion. Danyang–Kunshan Grand Bridge currently holds the Guinness World Record for the longest bridge in the world in any category as of June 2011.